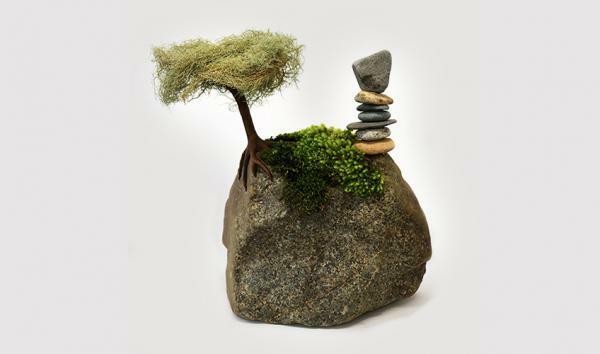 Bohemian sculpture artist, Oli Gedye, designs meditative artwork using kinetic art principles – art that is meant to be touched and played with – art that draws upon trees, wood, stones, rivers, mountains, valleys and moss. Oli’s artwork combines the rich colours and raw textures of nature, the pitch of sounds within the forest – a meshing together of the intrinsic connection between nature and creativity. "If a tree falls in a forest and no-one is around to hear it, does it make a sound?" To truly appreciate the depth and creative vision of Oli’s work one needs to physically connect with each piece – to engage in the human experience of it. To see it, hear it, smell it and (if allowed by the artist), touch it. This visceral human experience of both observation and knowledge of its physical reality is essential to a greater understanding of each sculpture. © Oli Gedye. 'Earth Tone' sculpture. Art making, freethinking and being at one with nature is an integral part of Oli’s core being. He produces artworks that are kinetic, meditative and interactive – works that use mostly organic, raw, natural media. It is art that can be touched and felt. 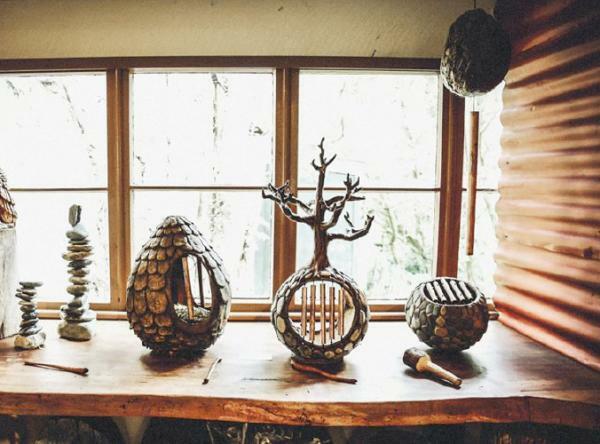 Working from an isolated old house truck studio, set amidst a forested valley within hearing distance of a nearby river (and falling trees, should they occur), Oli makes kinetic sculptures that merge natural themes and forms with sound. © Oli Gedye. ‘Earth Tone’. It’s not uncommon for him to have at least several projects on the go at once – inside his studio and out, a constant state of creative chaos around the late night glow of a campfire. Oli came to The Learning Connexion to gain a deeper understanding of his art and his own practice. TLC offered Oli the ability to study art via distance learning, with the added benefit of being able to study and live life his way, at home, where he felt most creative. 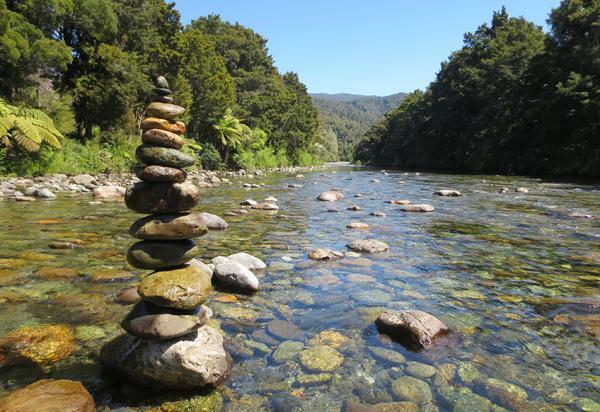 In this case tucked away in Anatoki valley within Golden Bay. Anatoki Valley displaying one of Oli’s transient rock sculptures. Very much involved in the local art scene within Golden Bay, Oli is a keen gardener and does creative landscaping. 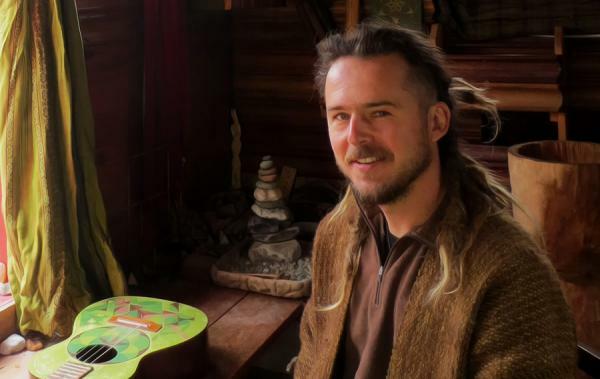 He has worked in conservation and enjoys living close to the land and working with permaculture. This comes through in his work. The combination and contrasting of the natural world with the man-made world by way of the concept of materiality, retains the true nature of the raw materials he uses. Oli’s collection of work called ‘Earth Tone’ uses materiality with the idea of sound as a sense alternative to vision. The tuning of each of the copper chimes began with a close approximation then a gradual refining of the length to reach the desired tone. “Musical instruments are some of the most elegant objects made by people. The shape of a cello is beautiful to the eye but its shape is designed for sound. My sculptures are far from the grace of a cello, but I am fascinated by the sounds different shapes produce. These works are a playful exploration of that." © Oli Gedye. 'Earth Tone'. With plans to travel to Australia in June, Oli is off to help build an earth house in far North Queensland. He will also be heading off to Indonesia to collaborate with other artisans and bring some of his jewellery designs to life. Keep an eye out for his upcoming exhibition in Nelson this October. This exhibition will feature new sculptures that are an extension of his ‘Earth Tone’ collection and earlier work from The Learning Connexion. Gain NZQA art qualifications from your home (or house truck) via distance learning. To find out more about how we teach practising artists art and creativity at The Learning Connexion call us on 0800 278 769 or request a prospectus.